Whilst still trying to think of ways I could push the 3D Zoetrope technique further, I started to think about combining it with another technique I'd been exploring as part of my Masters course in Norwich a few years before - projection mapping. The idea with this video was to try and mask off one of the pieces of balsa wood for each frame of animation and project onto it so that the projected animation would match the motion of the wood when it was played back. 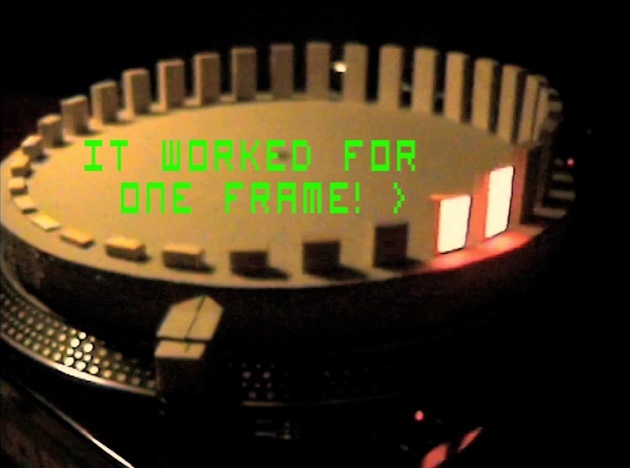 So in After Effects I masked the outline of one frame, whilst projecting onto the corresponding frame of balsa wood on the Zoetrope, moved the record deck around one frame, and repeated the process for the remaining 32 frames. In theory this would then allow me to manipulate each of the individual zoetrope frames whilst they were moving, and therefore break away from the limited 33 frame loop to introduce more variation. The subtle variations in speed of the record deck, combined with the fact that I had to perfectly time the start up so that the zoetrope frames matched precisely with the projected animation, meant that this test was destined to fail. It was too intricate and needed to be too precise for it to ever realistically work, so I had to re-think the whole idea and develop a way to use the mapping technique in a less precise, more loose fashion next time.